At Safe Drinking Water Solutions, we believe in doing things right. That's why our commitment to providing you, our customer, the best-in-class water treatment options is important to us. Water treatment devices come in many different forms and prices. The cheapest products available often are of limited use, and the most expensive items don't guarantee the best product. While there are many treatment devices available today, there is not one that can perform all forms of treatment. Some devices will work well in some conditions, but not others. This is why understanding your water analysis and application is so important. When dealing with multiple contaminants, health threats, and aesthetic problems, it is important to identify which are of greatest concern and then choose the appropriate treatment technology. From small residential cartridge filters to large commercial media filters, we handle them all! Filtration applications range from the simple removal of dirt and sediment, to more complex applications such as removing iron, hydrogen sulfide, arsenic, dissolved organics and other noxious and harmful elements. Some filters are simple mechanical filters, others work by using an absorptive process, and still others will utilize the positive or negative charge of their media to capture ions or anions of the contaminants. By understanding the chemistry of what's in your water, our team of water experts will identify which of the huge range of filtration products will best serve within your water treatment system. Micro-biologically unknown or unsafe water must be boiled to become safe for drinking water purposes. However, there are other approved treatment methods which are also very effective at disinfecting your drinking water. There is a lot to consider when choosing the methods that are best suited to your application, and in some instances certain types of disinfection methods will be a mandatory requirement to be part of your drinking water system. When dealing with the potential threats of cysts, bacteria and viruses, there isn't one single device that is effective at all types of disinfection, so many water treatment systems incorporate multiple processes to achieve complete disinfection of your water. In some situations, if the proper care isn't taken in understanding the relationship between the source water analysis and the capabilities of the water treatment system, disinfection can lead to the formation of harmful disinfection by-products in the treated water. By understanding what's in your water, our team of experts will help determine the various features, benefits, and certifications each design element requires for you to become confident in the safety of your drinking water. 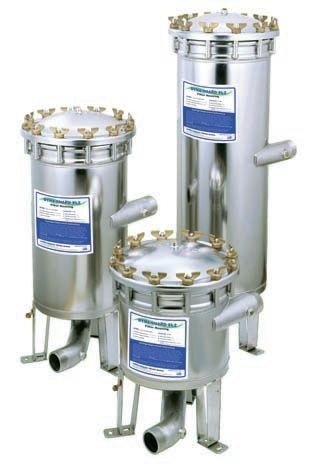 Some filtration devices can be certified to meet disinfection requirements. For large pathogens such as Cryptosporidium and Giardia Lamblia, special requirements are set forth to certify filters in their removal. Not all 1 micron absolute filter cartridges are equal! Our Dyna-Guard XL family of filter housings and cartridges are independently validated to meet the highest standard in oocyst reduction – the USEPA's Long Term 2 Enhanced Surface Water Treatment Rule (LT2ESWTR) standard, by an approved laboratory. The Dyna-Guard XL2 achieves over 99.9% reduction of harmful Cryptosporidium and Giardia Lamblia cysts from surface water sources. Our Dyna-Guard XL series filters are able to operate from as low as a gallon per minute flow rate, to hundreds of gallons per minute! Which makes them ideally suited for applications ranging from residential to municipal filtration applications as part of the multi-barrier approach to disinfection. Depending on which method of disinfection is used and depending on what's in your water, harmful disinfection by-products can be produced. By knowing your water and planning on a system designed to remove certain elements beforehand, you can reduce or eliminate the production of these harmful disinfection by-products. This proven technology is one of the most effective forms of water treatment available today. It is a process which typically removes 95-99% of dissolved matter from the water, and can make disinfection afterward much more efficient and effective, as well as virtually eliminates any risk of the creation of harmful disinfection by-products. Our reverse osmosis water purification systems offer some of the best features found in their class today. With automated functionality and computer control, these machines are easy to operate and maintain. No matter the challenges you face, our company's dedication to designing solutions that fit your unique situation is proven with many satisfied customers. As an OEM with wide access to hundreds of suppliers we can design, source, and integrate specialized components into virtually an water treatment and/or control system. Residential, commercial, industrial, no matter the size, call us today to find out how our team can help solve your water treatment challenges!